Alright you guys. I’m finally DONE with my pantry. It took me 2 days (and some change) but it’s DONE! 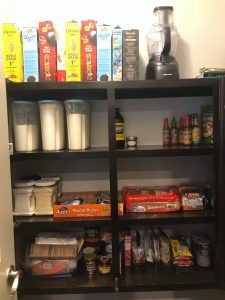 I showed it off to my hubs when he got home and pointed out some things that I’d like to do for better storage in regards to our bread, the boys granola bars, etc and he’s totally on board. I have a plan slowly coming together for the future in regards to my pantry. I’m already excited to re-do it all and then reveal it here because..I mean, who doesn’t love a good reveal after a renovation!? Those are my favorite! Here is the final bit of it finished! The top shelf had SO much stuff on it, it was just crazy! I also tossed some things I didn’t realize were even expired. I started grabbing things and secretly hoped it was expired so I could just throw it away instead of organizing it, lol, alas only 1 thing was expired. Ah well! Here’s my top shelf now 🙂 There are a few things up there that look messy because well..it’s bags of ingredients but as I mentioned in my previous post – I really need to get some glass containers and then empty spice containers for my own spice blends, etc. Same goes for this here on the top shelf – my homemade hot cocoa mix, cake flour, fresh ground Chile powders, etc. Look how pretty our honey is in those glass jars though! <3 The darker ones are from our Fall harvest while the lighter one is from Spring. Isn’t that crazy? I love it. Here’s a straight on shot of the pantry from the doorway now.. 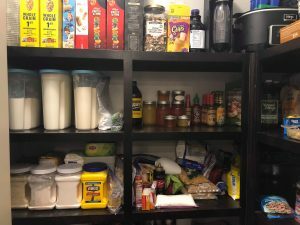 I wish there was some website or app that I could enter in the total dimensions of my pantry and the shelves, etc and then have the ability to create or see different organization techniques specifically with my pantry dimensions. 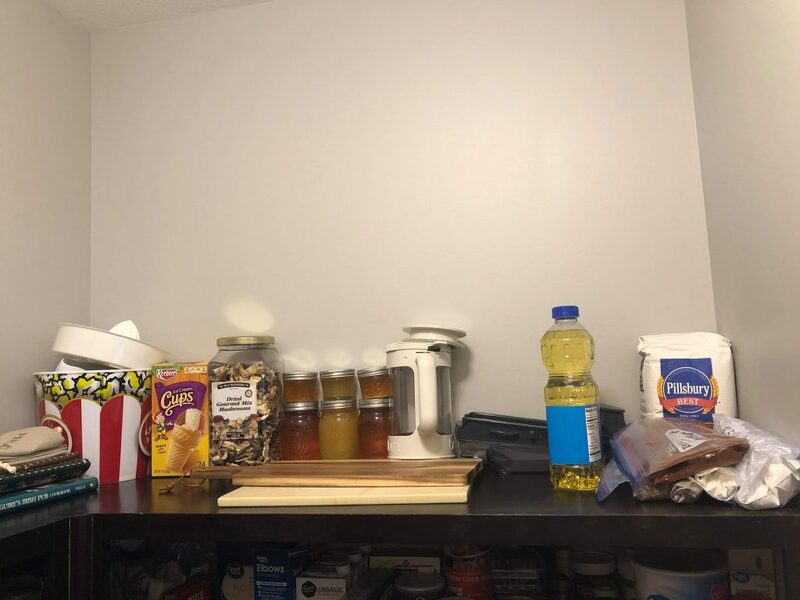 One of the things I mentioned to my hubs tonight was possibly having something for the very bottom of this side of the pantry, a type of basket or hanging shelf that we could store the bread and granola bars/crackers in. Anyway! Tomorrow I’m tackling the dresser in the master bedroom! Not the drawers, because let’s not get crazy here..I actually just organized them a month ago or so – but I’m talking more about actually cleaning off the top of the dresser itself. On my project list I wrote down master dresser + nightstand but we just have one nightstand and it’s on my hubs side of the bed, so it’s got all his crap in it. 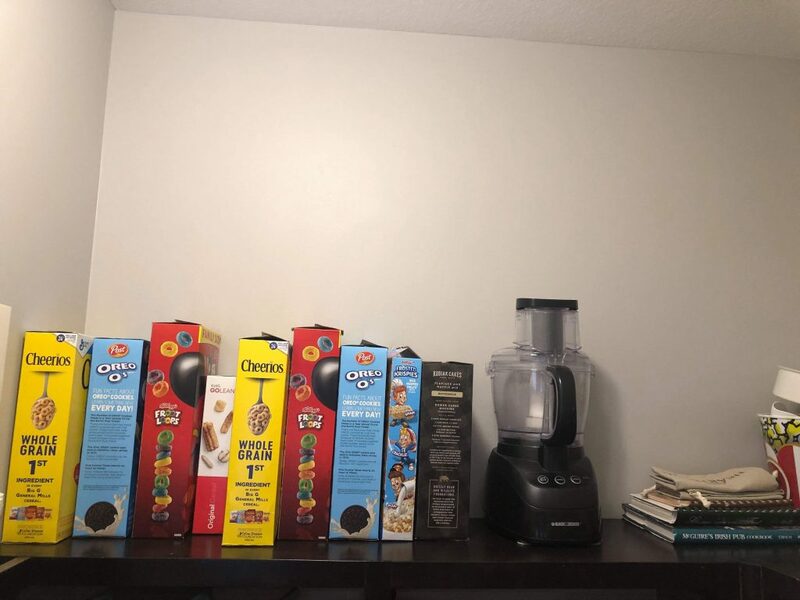 I realized today as I was looking around deciding what I would do tomorrow that while I could do the nightstand, it would be pointless as I would likely just take everything out of it and then leave it sitting on the top for him to go through when he got home. Oh..hey how about a side by side of the pantry! ?